Imagine you are an exchange student in America. Your friends say they want to go out for pizza and they ask you what you want to do? 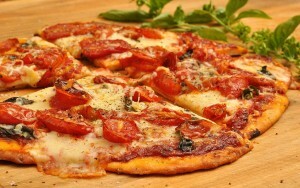 You are happy with pizza but maybe Chinese would be better. Do you think, “Oh, American people don’t conform to group pressure as much as Japanese people. Maybe I should express my preference for Chinese food”? Most people feel more comfortable if they can just go along with the group. It is very basic to communication; it’s difficult to communicate if we have to disagree with people all the time. We just want to behave in a way that is normal. In The Emperor’s new clothes, people could see that the Emperor was naked. They just wanted to fit in and avoid going against the group. Even if we think everyone else is strange, we still probably try to fit in if we can. You can see that C is the same length as the line on the left. But what if everyone else says the answer is A? Do you think you might change your answer? The Asch experiment tested people to see if they would conform to pressure from other people. Usually, they did. Photo. Psychologists have long been interested in how people try to conform to the group. In the 1950s, a psychologist called Solomon Asch conducted a famous experiment. 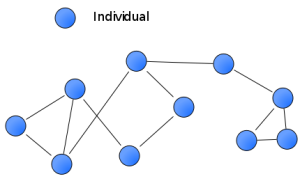 The subjects of the experiment were shown four lines as in the picture above, one on the left and the others on the right. 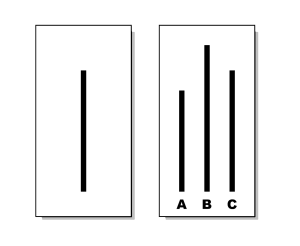 The subjects had to say which of the three lines A, B, or C, is the same length as the line on the left. Of course, it’s an easy test. The correct answer to the problem above is C. Normally, everybody can get the correct answer without any difficulty. However, only one person in the group is really being tested. The others are just actors and they deliberately give the wrong answer. 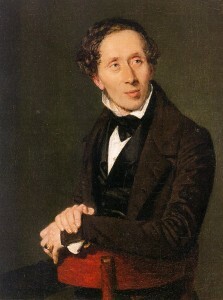 Generally speaking, people follow the opinion of the group. Some people begin to believe that the group knows better; some people know very well that everyone is giving the wrong answer, but they just go along with the group anyway. Will people go along with the group even if the group is doing something very bad indeed? Another psychologist, Stanley Milgram, found that people will often do very bad things indeed — causing other people pain, for example — so long as they think someone else is taking responsibility. 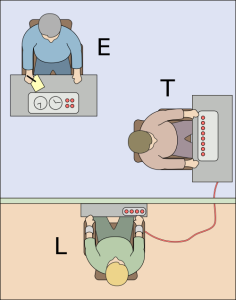 In Milgram’s experiment, subjects were ordered to give another person an electric shock. Of course, it wasn’t really an electric shock but the subjects didn’t know that. Usually, subjects were prepared to cause enormous pain to others, even if they thought it might be dangerous, so long as someone else was taking responsibility! We tend to think that countries like America are less conforming than countries like Japan. We think of Japan as a group-oriented culture where conformity is given high value. Interestingly, however, Japanese subjects were relatively unaffected by the actors in the Asch experiment. Actually, the Japanese had the lowest rate of conformity of all subjects in the Asch experiment. That is very unexpected. One psychologist (Matsuda, 1985) explained that Japanese people only really conform to strong pressures from members of their own group. 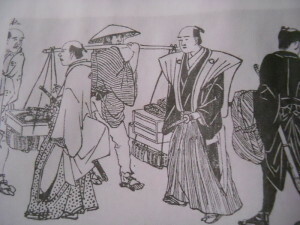 Japanese people do not conform to pressure from strangers. Check out the PowerPoint slides here. Asch, S. (1956). Studies of independence and conformity: a minority of one against unanimous majority. Psychological Monographs, 9, #416. Matsuda, N. (1985). Strong, quasi- and weak conformity among Japanese in the modified Asch procedure. Journal of Cross-Cultural Psychology, 16, 83 - 97. Milgram, S. (1963). Behavioral study of obedience. Journal of Abnormal and Social Psychology, 67, 371 - 378.